These sculptures consist of bamboo shish-ke-bob skewers and a pair of perforated, galvanized, steel splice plates available from the lumberyard. 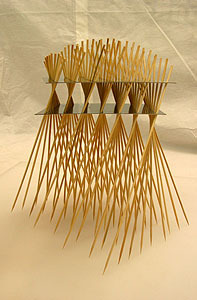 Simply twisting or skewing the plates relative to each other is enough to hold the entire assembly together. Radically different forms can be made depending on how close together the plates are, how close they are to the tabletop and how they are twisted. The only "work" involved in making it is to polish the plates, and that's purely optional.